Product prices and availability are accurate as of 2019-04-10 03:43:23 UTC and are subject to change. Any price and availability information displayed on http://www.amazon.com/ at the time of purchase will apply to the purchase of this product. Overall dimensions for the folded table are 36" (long) x 8-1/2" (wide) x 28" (high). Standing table dimensions are 84" long with headrest x 37" wide with armrests, with an adjustable height from 24-1/2" to 35-1/2". A 6-1/2" (long) x 4-1/2" (wide) face cradle on top of the table is removeable for quicker setup on the go. PREMIUM COMFORT: Table features deluxe cushioning, providing the ultimate comfort for your clients. The table top and armrest wings both are composed of a plush, 2-1/2" thick layer of high-density foam, and the face pillow contains 3" of foam with a removable cover. In addition, this professional massage table comes with a tilting backrest, and a plush bolster for lumbar support. 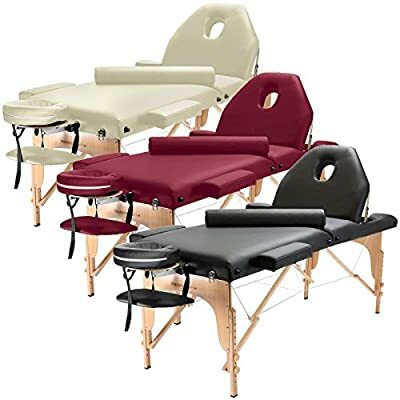 STRONG, STURDY SUPPORT: Precision crafted of premium-grade materials, this professional massage table features a hardwood frame and durable steel support cables, designed to accommodate a maximum weight capacity up 450 pounds. The adjustable headrest features a premium composite support, resistant to bending and warping. The table legs feature secure, non-slip, non-marring feet, which prevent sliding during massage as well as provide floor protection. CONVENIENT & PORTABLE: Lightweight yet sturdy construction in a streamlined fold-and-carry design makes setup and breakdown a breeze. Weighing just over 35 pounds, the table's compact design can even accommodate all accessories to be stored inside the table if desired. It locks securely with two professional chrome clasps, and features double handles for easy travel. Includes a durable nylon carrying case with an adjustable shoulder strap and side pocket to hold oils and supplies. OIL & WATER-PROOF: The entire table cover is draped in a luxurious PU synthetic leather, a highly durable, soft, and vegan-friendly material that is not only easy to clean, but has no offensive smell like other synthetic materials. It is also oil and water-proof to resist stains. DETACHABLE ACCESSORIES: Customize the table for each client, with an arm sling under the headrest as well as winged armrests, allowing for comfortable repositioning as needed.